International key-note speaker with special knowledge in central subjects of innovation management, especially in earlier phases of innovation processes. In recent years specialization on open innovation with focus on inter-organizational collaboration and strategic alliances. Recently his role changed from his former function of “Director Open Innovation Networks” at Swarovski Professional to “Swarovski Innovation Evangelist”. 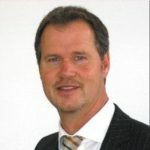 In this new role he is connecting Science and Business Ecosystems within the new model of “Innovation Ecosystem Logics”. Invited to talk at over 40 conferences and innovation events in recent years on international level. Winner of the “Best Open Innovation Award 2015” from Zeppelin University Friedrichshafen in the Category “Open Innovation Networks”. In previous functions, among others, also responsible for the operation of a cross-functional innovation incubation group, called i-LAB as well as for heading the product development department. The 1960 born mechanical engineer underwent several executive trainings, among others, at the Harvard Business School and at the IMD in Lausanne; additional trainings in systematic organizational development as well as in systematic coaching.